The JW Marriott Desert Springs Resort & Spa in Palm Desert, Calif., will make a 10-pound donut and wheel it straight to your room. Might as well call it Palm Dessert. Donut-adoring couples and bridal parties might want to take note, especially if you’re on the lookout for a novelty bachelorette party or honeymoon destination. 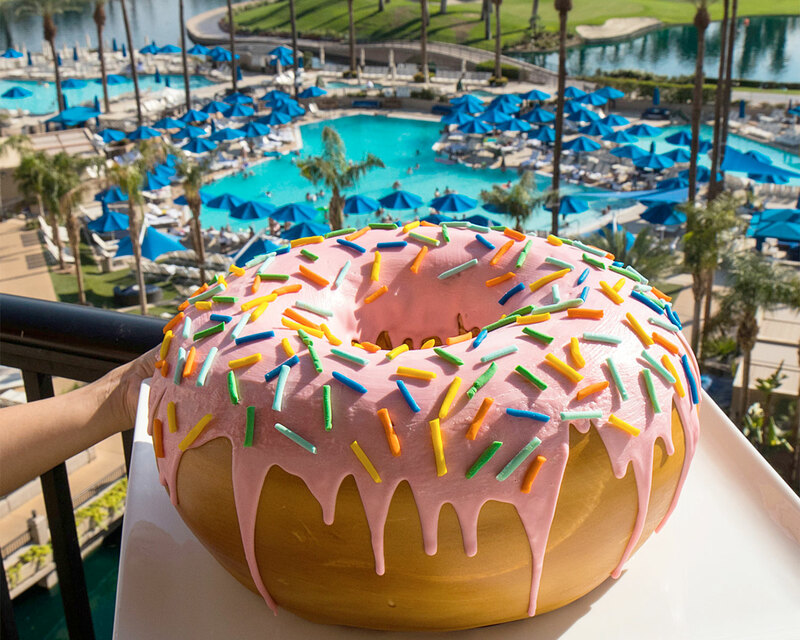 The JW Marriott Desert Springs Resort & Spa in Desert Springs, California, is serving up something you have to see to believe: a 10-pound, 3-foot donut delivered straight to your room. Sweet-loving guests can order the massive pastry for the low, low price of $219. The confection also comes with a side of milkshakes, so make sure you’re ready for a substantial sugar high. It’s all part of the hotel’s “Donut Disturb package,” which also comes with a $50 property credit that can go towards the spa, the golf course or dining. But who needs that stuff when you have a giant donut to consume? Donuts have long been a favorite treat amongst brides and couples. One bride’s wedding recently went viral after she surprised her bridesmaids with donut bouquets. Be the first to comment on "You Can Now Have This 10-Pound Donut Delivered Straight To Your Honeymoon Suite"